Perched atop the rolling hills of Sicily and with Mount Etna as backdrop, it’s no wonder many of the 20th century’s most prominent writers and artists sought the terraces of the Belmond Grand Hotel Timeo on their creative pilgrimage through europe. In Arthur Miller’s play “ A view from the Bridge” Marco, an immigrant from Sicily bemoans the fate of his children “ If I stay [ in Sicily] they will never grow up. They eat the sunshine”. Perched on the room balcony of the Grand Hotel Timeo, with Mount Etna and the sparkling Mediterranean sea in full site, that doesn’t seem half as bad as it sounds. Though Arthur Miller never took his pen and paper down to this hotel at the heart of Taormina, many other artists and writers did. Then a humble 5 room hotel overlooking one of the best views Sicily has to offer, its terraces attracted the likes of Oscar Wilde, D.H. Lawrence, Guy de Maupassant, Van Goethe and a slew of other literary greats going on the Grand Tour. The writers have come and gone, but the muse they all came for, is still present. With every room at the hotel overlooking rolling hills, villages and Mount Etna, there’s a veritable wow factor present every time you pop open the curtains. When the sun sets, and the the landscape waves "arrivederci" what’s inside the hotel, is just as charming with old polished parquet floors, and a curated collection of antiques and paintings channeling that old-world atmosphere you’ll find so hard to tear away from come check-out time. 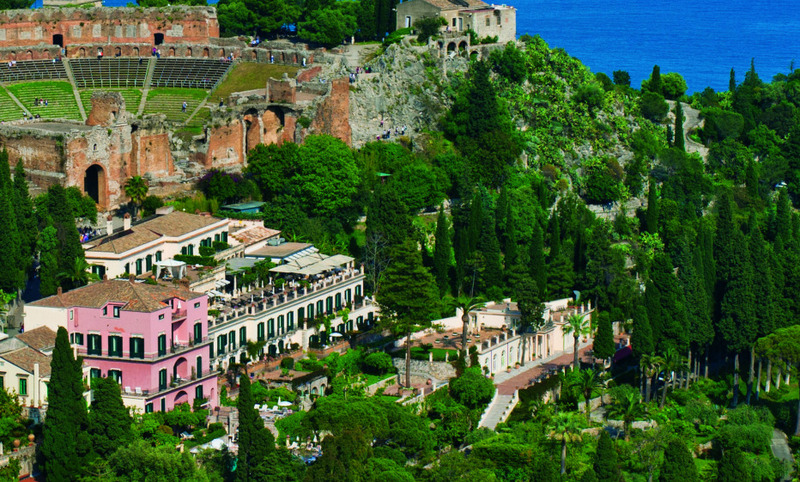 The hotel has a fantastic location in front of the Greek Theatre, overlooking the bay of Taormina and Mount Etna. The hotel is surrounded by a 6-acre park and magnificent gardens where the panoramic pool is located. Guests can discover the Sicilian East Coast with the complimentary boat excursions.